This paper put forword a new image reconstrct alorithm for ERT based on RBF neural network , and has reconstructed images used the measurement data obtained from the ERT simulation software developed by the authors , it has been compared with other traditional image reconstruct algorithms. The result shows that RBF neural network is suitable for solving the nonlinear problem of ERT image reconstruction ,this algorithm has advantages of high speed and high precision. Electrical resistance tomography (ERT) is a new technique for imaging the interior of an object without disturbing its normal function , it is suitable for aqueous-based process , eg. Miscible liquid/liquid mixing , solid/liquid mixing and cyclonic separation process etc. ERT offers a non-invasion , low-cost , non-destructive , non-radiation , visualization-measurement manner. The tomographs produced by this apparatus can be used to understand the process kinetics better and provide on-line control of the process to reduce energy consumption and increase product yield. It has been interested by many scholars in different countries and developed very fast. The principle of ERT is reconstructing the resistance distribution and forms an image to reflect the different phase substance distribution in the pipe or vessel. The obtaining of the image is through certain reconstruct algorithm , which will decide the quality and precision of the image. But the inherence problem of ERT image reconstrction is an ill-conditional , nonlinear inverse problem , so it is difficult to reconstrct the true distribution of the different matter in the pipe or vessel , there are many drawbacks in existing alogrithms such as the calculation time is too long and the distortion is serious etc , solve the problem of speed and precision is urgent and important. This paper put forword a new image reconstrct alorithm for ERT based on a Radial Basis Function(RBF) neural network , neural network has the specific property of parallelly process and approach nonlinearily, it is suitable for solving the nonlinear problem of ERT image reconstruction , and has reconstructed images used the measurement data obtained from the ERT simulation software developed by the authors in NEU. The speed of convergence of network is very fast , the output error is less than 10-10. After add measurement noise of 1% , it can still get good images. It has been compared with two other traditional image reconstruct algorithms : back-project algorithm and sensitivity coefficient algorithm , the result shows that RBF neural network is suitable for solving the nonlinear problem of ERT image reconstruction , the error of the image by RBF neural network algorithm is within 5% , this algorithm has advantages of high speed and high precision. In formula (1),Ñ is gradient operator, f(x,y) is the function of voltage distribution in the sensing field, W is region of the sensing field, ¶Wis the boundage of W , s(x,y) is the function of unkown conductance, J is the excite current density which is exerted on the sensor electrode, UJ0 is the function of the voltage distribution boundage, ¶f /¶n is the direction derivative along the boundage. When s (x,y) is known, the problem of solving the f(x,y)in any point in the field is called forward problem of ERT, which is from (1a) (1c)or (1a) (1b) to solve f(x,y), it is problems all known that Dirichlet problem and Neumann problem of Laplace equation, the solution is suitable to meaning of Hadamard. Authors adopted finite element method (FEM) and have set up ERT simulateion software, with it got the solution of forward problem of ERT conveniently. From the known boundage condition of UJ0 to reverse compute s(x,y) is inverse problem of ERT, it is the finally aim of ERT, but the solution is unsuitable and nonlineary. To conquer the unsuitability and nonlinearility is the key and difficulty of ERT image reconstruct, so must adopt suitable reconstruct algorithm to gain high precision solution. An ERT system can be divided into three basic parts as shown in Fig.1 : the sensing array, the data acquire & process system and reconstructing unit. A set of rectangular electrodes are mounted flushly inside surface of a process pipe to form an annular sensing array. These electrodes are excited by a current source one pair by one pair in turn, and all the voltages values between any other two eletrodes are measured. These data reflect the interaction between the conductivity distribution in the region of interest interaction complyes with Laplace equation. The total number of independent measurements is N(N-3)/2, where N is the number of electrodes, being 104 for 16 electrodes, these data are fed into a computer to reconstruct the image of conductivity distribution using qualitative or quantitative algorithm. The last step is to extract useful flow parameters from the reconstructed image by the computer, such as concentration, velocity etc. Before training the network, the 104 measurement value had been normalized between 0-1 in order to make the neural network distinguishing those resemble training sample and the learning apt to convergence. The learning method of the neural network adopt teacher guide selecting RBF center. During each time of learning produced a radical basis function neuron, such again, the number of neurons increased continuously until get the expected error or get the maximum epoch (detail of the procedure of the training-learning of RBF neural network is in the reference ). 60 typical flow pattern samples had been trained for the network, there are 104 measurement voltages for each flow pattern, so the input of the network is a matrix of 104´60,the pipe is divided into 800 pixels, therefore the output of the network is a matrix of 800´60. The convergence speed of the RBF network is very fast, when trained for 58 times, the error of network output is 10-10,the curve of error-training is shown in Fig.4. Using the ERT simulation software set up by authors to set conductance distributions of different flow patterns, then solved the numerical value of the ERT sensing field, used the simulation data to research ERT reconstruct algorithm. Suppose the continuous phase (liquid phase)s=100mScm-1, dispersed phase (solid phase)s=10mScm-1, the exciting current value is J=1mA. To verify RBF neural network reconstruct algorithm, adopt measurement values flow patterns which had difference from the training samples, the network output value as the 800 pixels grey value filled into the 800 elements respectively, then get the conductance distribution image of the sensing field. The result of image used RBF neural network reconstruct algorithm compared with that of other reconstruct algorithm, the results is shows in Tab.1. As Tab.1 shown, the image quality based on RBF neural network reconstruct algorithm is better than that of other algorithms. For the centre position in the sensing field, also can get correct image. 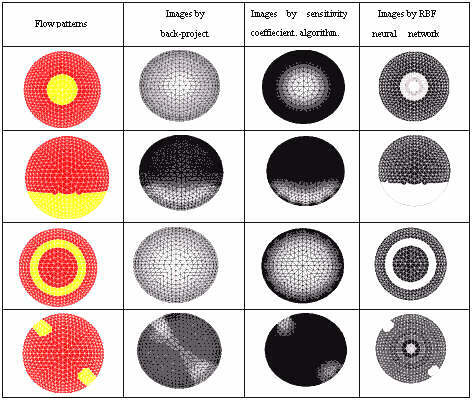 As for "centre flow" and "annular flow" pattern, the error based on back-project and sensitive coefficient method is much bigger than that of based on RBFneural network algorithm. It also can define a norm of space image evaluate SIEn, based on error theory in measurement science, to evaluate precision of different kinds algorithm[4,5]. The analyses above shows that RBF neural network reconstruct algorithm is suitable to solve the nonlinear inverse problem of ERT. It not only overcome the shortcomings of large calculate amount and low speed, but also raise the precision of reconstruct image. If the number of samples increase to several hundreds or several thousands, the reliability of RBF neural reconstruct algorithm will be enhanced greatly. The peculiarity of high reconstruct speed and high image precision of RBF neural network can be used into dynamic and intime measurement of two-phase flow.